Successfully Added Eagle Dash Cam - 1080p Full HD Car DVR (HDMI, SD, Motion Detection) to your Shopping Cart. 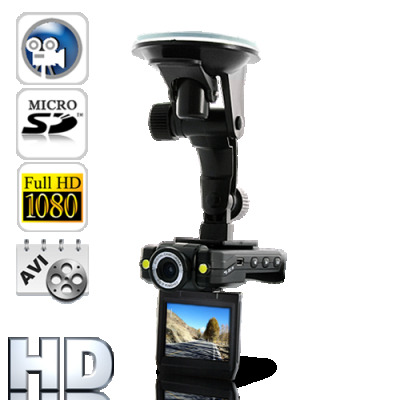 Conveniently record hassle-free Full HD 1080p video in your car with this amazing new powerful mini Car DVR. This little beast of a Car DVR can record 30fps video at 1080p/720p/480p. The wide angle HD Eagle Dash Cam will capture clear video for monitoring you car or journey; providing the ultimate DVR experience for an amazing price. It has a flip-out LCD Screen, anti-shake function, a versatile mount, rotating cam head, a solid black casing and USB cable, MicroSD card slot, Motion Detection, and so much more! You can even set it up to record your passengers and swivel the LCD screen, then re-enact some of those funny YouTube videos where people drift their cars with a frightened passenger and record it. The compact black Eagle Dash Cam is very easy to setup, mount and start recording from the moment the device is turned on. It performs very fast from turning on to recording. You can record in 3 Different Modes, power on normal continuous recording, motion detection recording for security and cycled recording for saving data space. It has a multi-language menu which is very easy to navigate; you don’t have to mess around with this camera to get it to work. Just switch the gadget on and it can instantly auto-record awesome HD video. It has a great 140 degree Wide Angle view for getting the full view of the road in front of you, the Lens also rotates 180 degrees and the LCD screen 270 degrees. All this plus an easy-to-setup suction pad and a versatile mount mean you can set the camera up however you want. Have you ever thought about or encountered problems with proving what happened in road accidents or problems with the traffic police. With this great little gadget, your problems will go away, you can conveniently record high quality video so everyone from general drivers, police officers, journalists, detectives, lawyers, taxi drivers can have the evidence they need, that will hold up in court to prove what they encountered is true. Occasionally you might notice some crazy moments on your journey like a crash or a weird encounter, and I’m sure you know what I mean when sometimes you feel a bit of regret, in that you couldn't record it because it was a random moment and you didn’t have time to prepare. With the Eagle Dash Car Cam, you can record video for hours and even cycled recording so you don’t take up too much data space, this way you can be confident that you will always be prepared for the unexpected when you are driving. If you want a hassle-free, high quality mini-camera, then this is the gadget for you. Available to order from our warehouse right now, this Full HD Car DVR is ready for immediate shipment to you or your customer. Guaranteed to be the next hot item in your online store, order now to look forward to nice profit! With a great 12 month guarantee, you can be sure you’ve made the right decision, brought to you by Chinavasion, the leader in wholesale consumer electronics. Press Menu and the right arrow to turn on the LEDs. Press Menu and the left arrow to turn off the LCD to save power. You can charge the device from the included Car charger or using the USB cable with your PC. on 2011-11-17 01:38:41 VERRY GOD PRODUCT! I use this all the time. Now I think I can't drive without it. I even use it when I go flying. It makes me conscience of my driving and I drive safer. Excellent video quality. I'm going to install another for rear looking. Also, great for security with the motion detect feature. While flying, I get great videos and can self critique my landings and takeoffs plus provide videos for my passengers. Now girlfirend wants one for her car. on 2011-08-17 21:16:48 HIP-HIP HURA GREAT PRODUCT!!!! Thanx!ITS MINE!VERRY GOD PRODUCT,OPTIONS,CABELS....!SPECIAL THANX Chinavasion On-Line Help!!! !